Here’s a refreshing take on metropolitan economic health from the right side of the aisle: The conservative Free Congress Foundation says it’s time America got serious about investing in transit in its metro areas. This think tank, founded by conservative Paul Weyrich (also co-founder of the Heritage Foundation), released a report [PDF] last week extolling the economic benefits of transit investment and healthy cities. The Free Congress Foundation is also holding congressional hearings on its findings on the Hill, bringing some much-needed conservative support for walkable, connected cities to Washington politics. The report argues that returns on investment in highways are declining. Author Michael Bronzini says healthy, walkable cities are important to attracting talent in a knowledge-based, 21st century economy. “These new urban residents want walkable communities, social and cultural amenities and good public transportation services that will enable them to access all the opportunities that vibrant central cities have to offer,” Bronzini adds. While some prominent conservative electeds have starved transit and approached the movement toward cities as a political threat, others, like Michigan Governor Rick Snyder, have shown leadership and recognized the economic value of creating more walkable places. The Free Congress Foundation’s report is more evidence that Republican transit opponents don’t speak for all conservatives when it comes to transportation policy. Is this a new printing? It sounds a lot like the one i’ve had for a couple years. Is it this one, a new edition of the same, or a completely new report? Weyrich, Paul M., and William S. Lind. Moving Minds: Conservatives and Public Transportation. 1ST ed. Reconnecting America, 2009. The PDF link doesn’t work. 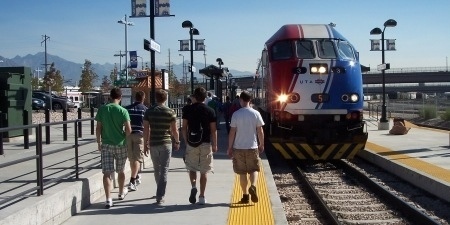 In the event that the us government truly desired to increase transit ridership, they would consider which $200 zillion as well as discover a way of having much more steady functional financing in order to transit techniques such as the TTC, to allow them to enhance support amounts, construct capability, and gives a far more persuasive high quality associated with support which will persuade individuals to turn out to be normal transit customers. Obviously, enhancing transit support had been in no way truly the Traditional objective using the plan. Certain, they might increase functional financing and find out much better transit support consequently. However there is no photo-op or even politics effect with this. However having a taxes credit score, you are reminded each year from taxes period since the Conservatives attempt to purchase your goodwill with your personal cash. Yes, it is good for the business of cities to have good transit, walking and biking conditions. Here in NYC we’ve been working on the Bike Friendly Business campaign to re-inforce this concept one small business at a time. A surprisingly overwhelming majority of business owners and managers are willing to declare themselves “bike friendly” because they see that customers arriving by bike are good for business. The Western European cities that some bike lane critics like to lampoon in the media are mostly thriving economically, especially in pedestrianized and bike-heavy areas. (Berlin and Copenhagen both come to mind). Sorry. That should be fixed now. The late Paul Weyrich was afflicted w/ a love for rail which his otherwise far Right philosophic POV could not apparently erase. FCF used to have a transit news page, Weyrich supported Amtrak, and FCF published a rail oriented magazine for many years full of railfan generated articles on the resurrection of rail transit in the US. The website once had a wonderful article explaining that conservatives should support rail transit so that dad wouldn’t need a car to commute and mom could stay home to raise the kids in some retro Ozzie and Harriet fantasy suburb. How Could Transit Agencies Cope With a Sudden Loss of Federal Funds? Under Trump and the Republican Congress, transit agencies can't be certain the funding they're expecting will materialize. Via TransitCenter, here's a look at how cities have coped with the sudden and dramatic loss of resources. Transit’s Identity Crisis: Social Service or Economic Engine?